[206 Pages Report] The global high-performance film (HPF) market is projected to reach USD 42.25 Billion by 2020, registering a CAGR of 7.51% from 2015 to 2020. The report aims to estimate the market size and future growth potential of the HPF market across different segments namely, material, type, application, and region. The base year considered for the study is 2014, and the market size is forecast from 2015 to 2020. The high growth in the flexible packaging and construction industries is driving the HPF market. Global population growth is expected to increase at a steady rate. The consumption of packaged food and healthcare products is estimated to increase in proportion to the rise in population and changing lifestyles. HPFs are used by the construction industry for purposes such as light control, safety & security, and decoration. The prevalence of construction activities in developing regions, triggered by rapid industrialization, is consequently expected to drive the demand for films. In the secondary research process, various sources have been referred to for the identification and collection of information for this study. These secondary sources include annual reports, press releases, and investor presentations of companies, white papers and certified publications, and articles from recognized authors. In the primary research process, sources from both, the supply and demand sides have been interviewed to obtain qualitative and quantitative information. The bottom-up approach has been used to estimate the market size, in terms of value, of the HPF market on the basis of material, type, application, and region. The top-down approach has been implemented to validate the market size, in terms of value. Through the data triangulation procedure and validation of data via primaries, the exact values of the overall parent market size and individual market sizes have been determined and confirmed in the study. The figure below provides a break-up of the profile of primary discussion participants. This study answers several questions for stakeholders, primarily which market segments to focus on in the next two to five years for prioritizing efforts and investments. These stakeholders include HPF manufacturers such as The 3M Company (U.S.), Dow Chemical Company (U.S.), Solvay S.A. (Belgium), Covestro (Germany), E.I. DuPont de Nemours and Company (U.S.), Evonik (Germany), and Honeywell International Inc. (U.S.). 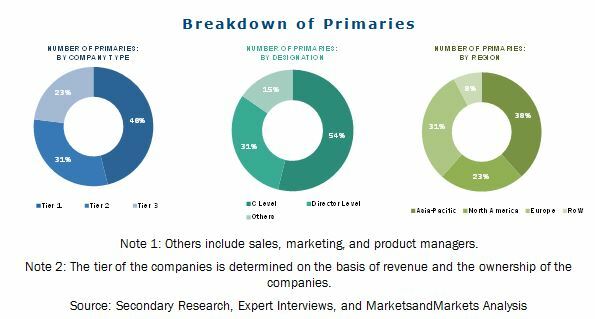 The report segments the market for HPF on the basis of material, type, application industry, and region, and provides a forecast of revenue growth and an analysis of trends in each of the submarkets. 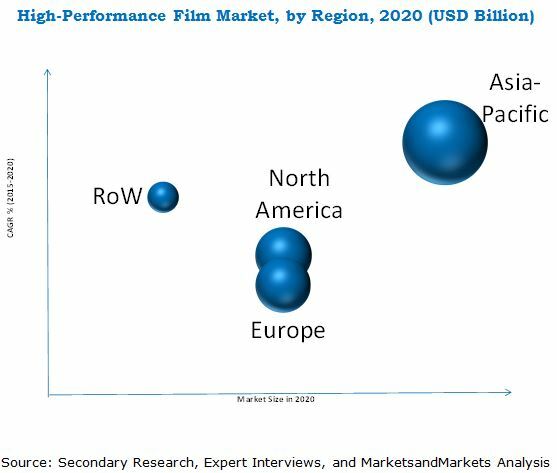 The global high-performance film (HPF) market, in terms of value, is projected to reach USD 42.25 Billion by 2020, growing at a CAGR of 7.51% from 2015 to 2020. High-growth application areas such as construction, packaging, automotive & transportation, and electrical & electronics, and extensive product launch and agreement & collaboration activities by companies are key factors driving the growth of the global HPF market. Fluoropolymers are projected to constitute the fastest-growing material type segment of the HPF market. The major polymer types available in the market are polyester, EVA, polyolefin, polyamide, fluoropolymers, polycarbonate, and others. Polyester is estimated to be the largest market for HPF, as polyester film has excellent tensile strength, dimensional stability, and tear resistance. It is also durable and clear, and exhibits inertness towards several chemicals, including weak acids, bases, and many solvents. The HPF market has been segmented on the basis of type into barrier, safety, decorative, microporous films, and others (water soluble and biodegradable films). Barrier films are a suitable substitute for other films, as they increase shelf life, serve as printing substrate, and reduce the need for preservatives. Barrier films have constituted the largest type segment over the past few years, on account of the increasing scope for applications in photovoltaic cells and semiconductor insulations. The HPF market is expected to witness substantial growth, due to the increasing demand for and adoption of the films in various applications, including construction, packaging, automotive & transportation, electrical & electronics, aircraft/aerospace, and other applications (photography, personal car, clothing, and office products). Packaging is the largest market for HPF, as barrier resins (primarily nylon and polyolefin-based films) are the primary products used in this segment. HPFs offer lightweight and high-performance characteristics such as reduced processing costs, easy assembly, reduced finishing time, and design flexibility. Currently, Asia-Pacific is estimated to be the largest market for HPF, accounting for more than half of the global market share, by value, in 2014. China dominated the Asia-Pacific HPF market in 2014, followed by Japan. India is the fastest-growing market for HPF, and is expected to surpass China in the near future. The high economic growth rate, growing demand for applications (such as packaging, automotive & transport, aircraft/aerospace, electrical & electronics, construction, and others), low-cost labor, and competitive manufacturing costs are the main factors boosting the growth of the HPF market in the Asia-Pacific region. Although the HPF market is growing at a significant rate, certain factors could hinder market growth. High capital expenditure and the need for technical expertise are restricting the growth of the HPF market. Companies such as The 3M Company (U.S.), Dow Chemical Company (U.S.), Solvay S.A. (Belgium), Covestro (Germany), E.I. DuPont de Nemours and Company (U.S.), Evonik (Germany), and Honeywell International Inc. (U.S.), are frontrunners in the global HPF market. These companies have strengthened their market position through diverse product portfolios, strategically positioned R&D centers, consistent strategic development activities, and technological advancements. They have been adopting various organic and inorganic growth strategies, such as expansion, agreements & collaborations, and new product launch & development to increase their market share. Figure 35 Construction End User Industry of the HPF Market in the Year 2015.